First Line: You're an idiot, Meg. A little over six months ago, Meg Reed talked her way into a job working for Portland's Northwest Extreme magazine-- a job she was woefully under-qualified for. Now she's at Mt. Hood's remote Silcox Hut covering Oregon's elite high-altitude rescue team, the Ridge Rangers. Meg has beefed up her skills, but she still hopes to spend some time by the fireplace with a mug of hot chocolate. Instead she's outside in a blizzard when she hears gunshots. No one believes her until the body of Ridge Ranger Ben Rogers is found the next day. Now the entire group is snowed in, and Meg has to find a killer-- fast! When I read the first book in this series, Scene of the Climb, I have to admit that I wondered how far this series could go if Meg's duplicity and lack of qualifications for her job continued to be stressed. I am happy to say that they aren't in this second book. In fact, Meg spent the entire summer working on her athletic skills, so that earns her a lot of points in my book. She also doesn't put herself in needless jeopardy as often this time around. More points scored! Meg is still impulsive, and-- at the age of 23-- she has a tendency to think she's bullet-proof, but that goes hand-in-hand with youth. What we do have is a story that puts her mother and father in a different light from the previous book, and the author also does a marvelous job of putting us right in the middle of some of Mother Nature's best scenery. Another thing that I enjoyed while reading Slayed on the Slopes is being shown how Meg puts her article together: the writing, the photography, and how she used social media. All this really gave me a feel for being a magazine journalist. 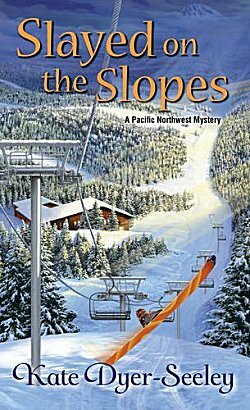 The mystery is also a good one, with the locked room aspect of being snowed in high on a mountain, and the author does a first-rate job of shifting the focus from one suspect to another. All in all, Slayed on the Slopes improved on the promise of the first book, and I look forward to seeing what sort of mess Meg gets herself into next. I just finished reading the first book in the series and will have my comments up on Monday. I enjoyed hearing the author at Left Coast Crime and the Oregon settings of these books would draw me in regardless. I like that a couple of my quibbles with the first are improved in the second. Can't wait to read this one. The next concerns wind surfing on the Hood River. Something I'll never do, but fun to read about I expect. I always love it when an author listens, learns, and makes improvements in the next book, don't you?